The Herdmans are the worst kids in the history of the world; they lie, steal and cheat. Now they have taken over the church’s annual Christmas pageant! The entire town has gathered in anticipation, waiting to see the Herdmans ruin Christmas – or will they? This funny, heartwarming, holiday tale has become a classic: and good for the entire family! Please plan on arriving at the beginning of the audition session. PPF DOES NOT use an assigned timed slot audition system. The director will conduct an “ice breaker” at the beginning of each audition session. This process is fun and designed to help actors relax prior to auditions and gives the director a chance to quickly see each actor on the stage. Auditions for speaking roles will consist of cold readings from the script with audition sides provided at the auditions. Please plan on arriving at your chosen audition date at the beginning of the audition session. We do not use an assigned audition time slot system. The director will have you up and down on stage multiple times during the audition (how many times will be at the director’s discretion and depend, in part, on the number of auditioners who attend). You will be able to sit in the theater and watch all the auditions. You may be asked to go into the hallway with audition partners and work a bit on a scene before taking the stage. You may be asked to read for other parts you may not be auditioning for. The Providence Players strives to make our productions open to interested and engaged actors & actresses regardless of their level of experience. We try and make our auditions as relaxing and fun as possible. You are welcome to come to more than one audition session. This is NOT a requirement. MEMBERSHIP- The Providence Players of Fairfax is a membership organization. Membership is not required to audition. If cast, actors in addition to production team members will be asked to become members of the Providence Players ($10) for the season (if they are not already). Production Schedule– A copy of the preliminary production schedule is included with this announcement. Please note that the times listed on the preliminary production schedule are theater access time NOT CALL TIMES which will be provided by the director. The Preliminary production schedule is subject to change based on the needs of the production. 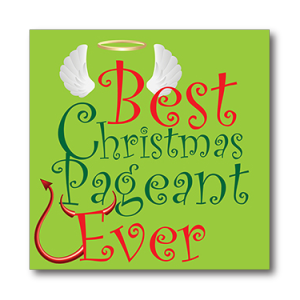 Download Best Christmas Pageant Preliminary Production Schedule Only Here. All auditioners will receive notification via phone call or email regardless if cast or not by Monday October 24th. We will not hold Call Backs! Read-Through Meet & Greet will be Tuesday October 25th at 6:30PM in the James Lee Theater; All cast members are on call for read through. Scripts and other materials will be shared at this meeting. Those cast must be available for ALL shows and the entire rehearsal schedule from December 1st until we open December 9th. Parents will be required to sign an agreement on all these Important Notes and more regarding PAGEANT support this year at the first meeting. We thank you in advance for your efforts. The director plans on casting 27 or more actors: 7 adults (5 women, 2 Men) and approximately 20 children of varying age ranges:11 featured children’s roles (5 girls, 6 boys) plus other younger children’s roles ages 7-12 with some lines and a “Baby Angel Choir” comprised of children aged 5-6. The final number of children cast will be at the director’s discretion. BOB BRADLEY/FATHER: Age range 30+; smaller role of solid family man; husband to Grace and Father to Beth and Charlie. Must be able to present witty dialogue smoothly and carry a Christmas tree 50 feet or so. GRACE BRADLEY/MOTHER: Age range 30+; main role who takes over the annual Christmas pageant; mother to Beth and Charlie; wife to Bob. This actress needs to be comfortable leading the pageant within the pageant which includes directing a large group of child actors on stage. MRS. ARMSTRONG: Age range/must look 40+; Like the characters of Alice to Beth so are Mrs. Armstrong to Grace Bradley/Mother. Actresses going for this role should not hold back on showing their super over controlling and loud side. She uses a managerial voice and manner with everyone and everything in her life. Actresses going for this role should not hold back on showing their Type A traits in full. Medium part with comical lines. MRS. SLOCUM: Age range/must look 40+; one of a handful of gossiping ladies in the neighborhood – she is a pleasant and motherly women. Smaller role. MRS. CLARKINGSON: Age range/must look 40+; one of a handful of gossiping ladies in the neighborhood – she is a sweeter character than all the rest. Smaller role. MRS. mcCarthy: Age range/must look 40+; one of a handful of gossiping ladies in the neighborhood – she is more like Mrs. Armstrong than the others, but still hopes for good things in the end. Smaller role with a funny bit. REVEREND HOPKINS: Age range/must look 40+; Though a smaller role, this character is both pleasant and wise by nature; as well as an important catalyst to the moral of the story. This actor will also be given the Opening Announcements to the show which will be given live in the format of a sermon as presented in the audition monologue. Actors going for this role should really sell the minister part and be loud & joyful. BETH BRADLEY: Age range/must look 10-14; Lead role who narrates the show; should have strong voice and great stage presence; able to show an array of emotions. Sister to Charlie and daughter to Grace and Bob. Beth is a great role for an experienced young actress as she must set the tone and drive the entire show through her storyline. CHARLIE BRADLEY: Age range 8-11, must be younger than Beth; medium role; brother to Beth and son to Grace & Bob; typical little brother character but an all-around good kid. RALPH HERDMAN: Age range/must look 12-14; member of the Herdman clan of young ruffian siblings who are considered “the worst kids in the history of the world.” He is the oldest and should have a slouchy manner with touch of adolescent coolness. Any one auditioning for a Herdman role should show us their Best Bad kid routine. Small role. IMOGENE HERDMAN: Age range/must look 11-13; member of the Herdman clan of young ruffian siblings who are considered “the worst kids in the history of the world.” She is the oldest girl but the obvious leader of the Herdman children. She is loud, bossy & crafty. One tough cookie. Imogene shows an array of emotions from sassy to sadness in this play. This is a medium role and takes a strong young actress to portray her. Any one auditioning for a Herdman role should show us their Best Bad kid routine. LEROY HERDMAN: Age range/must look 10-12; member of the Herdman clan of young ruffian siblings who are considered “the worst kids in the history of the world.” He is the ‘tough guy’ and very sure of himself. Any one auditioning for a Herdman role should show us their Best Bad kid routine. CLAUDE HERDMAN: Age range/must look 9-11; member of the Herdman clan of young ruffian siblings who are considered “the worst kids in the history of the world.” He is also tough but more combative being a younger sibling and fighting for his position in the family; usually paired up with his brother Ollie. Any one auditioning for a Herdman role should show us their Best Bad kid routine. OLLIE HERDMAN: Age range/must look 8-9; member of the Herdman clan of young ruffian siblings who are considered “the worst kids in the history of the world.” He is the youngest boy and always Looking for trouble. Claude’s usually his partner in crime. Any one auditioning for a Herdman role should show us their Best Bad kid routine. GLADY HERDMAN: Age range/must look 6-8; member of the Herdman clan of young ruffian siblings who are considered “the worst kids in the history of the world.” She is the youngest – small and wiry with a feisty disposition. She provides comic relief in this show. Any one auditioning for a Herdman role should show us their Best Bad kid routine. Smaller but fun role. ALICE WENDLEKEN: Age range/must look 10-14; She is one of Beth Sunday School classmates though not necessarily same exact age; they are close in age. Alice prim, proper and often a pain in the neck with her goody two shoe routine. Actresses going for this role should not hold back on showing their super prissy side. Medium Role. MAXINE: Age range/must look 10-14; She is one of Beth Sunday School classmates though not necessarily same exact age. She has more lines than other roles as the narrator within the pageant of the play. Actresses going for this role should have clear & loud speaking voices. ELMER HOPKINS: Age range/must look 8-10; he is a little nerdy but still sweet. Definitely friends with Charlie Bradley and not a fan of the Herdmans or church despite the fact his father is the minister. OTHER SMALL KIDS ROLES: Ages 7 to 12. There are additional children roles with 1-8 lines each throughout the script which will be assigned accordingly to include singing carols in the older kid’s choir as well as *Baby Angel Choir. *BABY ANGLE CHOIR: Ages 5-6. These are new actresses and actors who only need to sing a Christmas carol at the audition. These children must be able to be on stage without their parents.